Behold: Autumn in a dish. Those colors, those flavors – swoon. 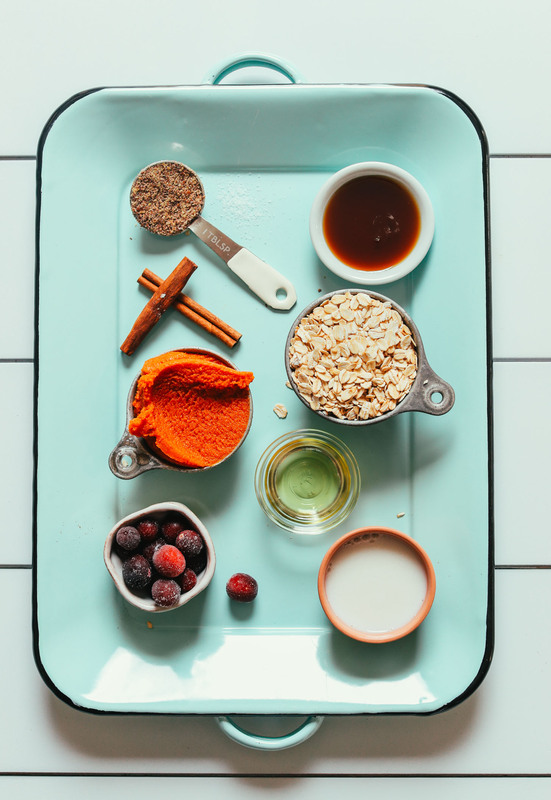 It has so many of my favorite ingredients, like oats, pumpkin, cinnamon, and maple syrup, and bakes up so beautifully. Consider this dish your 1-bowl go-to when oatmeal cravings hit. Let’s bake! This dish begins with flax eggs. Then we add pumpkin puree, maple syrup, pumpkin spices, and a little oil (for moisture and to help crisp the edges). This creates the base, and then we add dairy-free milk which will ultimately soak and help bake the oats! Once the milk is blended, you’ll add your oats and pecans and stir to saturate. Then simply transfer to a dish, top with additional toppings (optional), and bake! It’s that easy. I know – exciting stuff. This would make the perfect lazy weekend breakfast to feed the family – one batch makes six hearty servings! 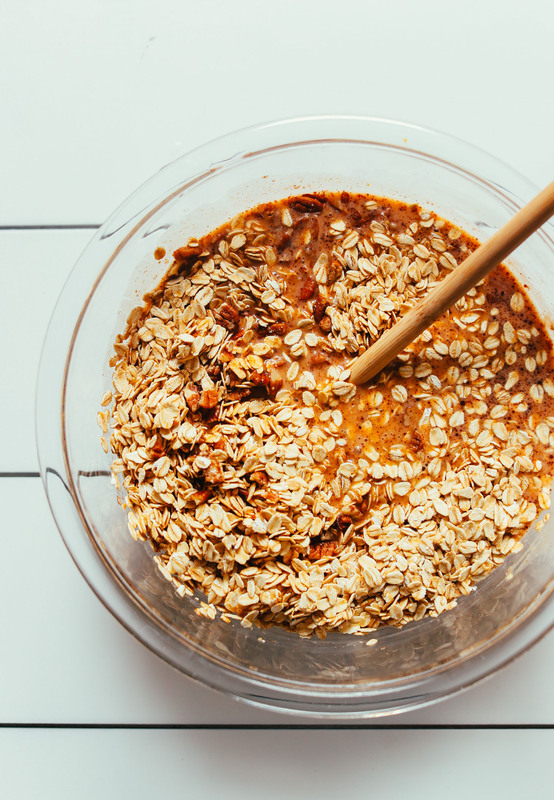 Or you can prepare the oats up until the baking stage, refrigerate overnight (which will make the oats super tender and creamy! ), and bake in the morning, which makes it totally doable for weekday breakfasts as well. 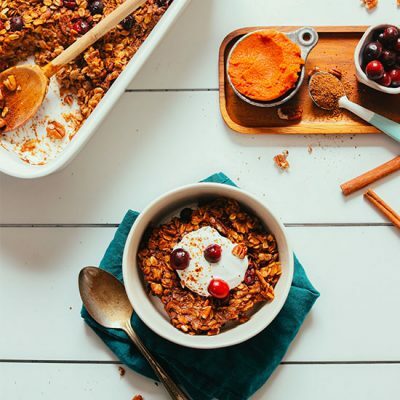 If you’re into oats, be sure to check out our Pumpkin Pie Oats, The Perfect Bowl of Steel-Cut Oats, Brown Sugar Pear Oatmeal, Blueberry Muffin Breakfast Cookies, and these 14 Granola Recipes! If you try this recipe, let us know! Leave a comment, rate it, and don’t forget to tag a photo #minimalistbaker on Instagram. Cheers, friends! Perfect baked oatmeal with pumpkin purée, warm spices and maple syrup, studded with pecans and cranberries. Made in just 1 bowl with 10 ingredients. Preheat oven to 350 degrees F (176 C) and grease a 2-quart (or similar size) baking dish with oil (or vegan butter). Prepare flax eggs in a large mixing bowl. Then add pumpkin purée, maple syrup, oil, salt, pumpkin pie spice, cinnamon, and whisk to combine. Add milk and stir once more. Then add oats and pecans and stir to combine. Transfer mixture to the greased baking dish and top with additional pecans. Sprinkle with coconut sugar for a “swirl” effect (optional) and cranberries (optional). Bake for 30-35 minutes or until the top is golden brown, the edges are slightly caramelized, and it has some springiness in the center. Remove from oven and let cool a few minutes. Serve warm with desired toppings, such as coconut whipped cream (or warmed coconut milk or almond milk) and a drizzle of maple syrup. Store leftovers covered in the refrigerator 3-4 days (or in the freezer up to 1 month), though best when fresh. Reheat in a 350-degree F (176 C) oven or in the microwave until hot, adding more dairy-free milk as needed to remoisten. *To make one flax egg, mix 1 Tbsp (7g) flaxseed meal with 2 1/2 Tbsp (22 ml) water, stir, and let rest for 5 minutes. *Check out a DIY Pumpkin Pie Spice here. *Nutrition information is a rough estimate calculated with avocado oil and almond milk and without optional ingredients. Love your site..great recipes and gorgeous pics. Have made this about a dozen times…scrumptious! I use 2 eggs and since I love pumpkin double or even triple depending on what I have on hand. I also put 1 large or 2 smaller diced apples. I use about a teaspoon of liquid stevia in lieu of syrup. Finally if any of you like a crispy, streusel type topping put all of your nuts on the top, sprinkle with cinnamon and any type of crystallized sugar. I made this today for a quick Christmas Eve breakfast. I used applesauce and no fruit on top it was easy, delicious, and filling. Thank you Dana for another great recipe to feed my vegan family members. Enjoyed. Always looking for variety. I particularly appreciate the all natural ingredients. We increased the cranberry content as well as baked longer to get some extra crisp. I made this Thanksgiving morning, followed the recipe except I used 1/2 Almond Dream Pumpkin Spice Nog and 1/2 full fat coconut milk because I had both already opened. It was so easy and delicious! Thanks, Dana for another winning recipe! Yay! Thanks for sharing, Patty! I didn’t add any sugar (due to candida diet) I added honey on top of my kids one. we love it. I used eggs. I made half wetter and half dryer. After baking first was more spongy cake like. Other half was like yours- crunchy. I like both. I will definitely make them again. Thank you. Great! Thanks for sharing, Joanna! This recipe was so tasty that, I will be making it again and again. It was very delicious. I made this for my family of 6 and it was a hit! The only modifications I made was raisins instead of cranberries and we are not vegan so I used two eggs instead of flax eggs. Delicious! And a perfect fall/winter breakfast with a little almond milk on top!! Made this for breakfast today. Subbed in 2 eggs and it turned out great! I will definitely be making this again!! Yay! Thanks for sharing, Jennifer! Delicious! I made this recipe as written only thing I did differently is I baked it in muffin tins as not everyone in my house is a fan of oatmeal and thought they would be easier for leftovers. Baked for 25 minutes. Made 11 muffins. Turned out perfect. This was so incredibly delicious! So warm and comfy! Warmed milk and maple syrup really was the perfect touch! Yay! Thanks for sharing, Tiffany! Can I use this recipe to cook it in my slow cooker instead of baking it in the oven? (I currently do not have an oven.) Thanks. Could I use aquafaba in this recipe? If so, what would I sub it for? Thank you for your help! I made this twice, love it! I substituted chicken eggs, walnuts, and used dried cranberries. I added ginger the first time. The second time I added chopped apples, that’s the best. This recipe is very forgiving, so don’t be shy about experimenting! Thank you so much for this recipe! I’ve made it twice now :) It is so hearty, delicious and just the right amount of sweet! Loved this recipe! I substituted agave nectar for the maple syrup. I will definitely make it again (and again and again). not sprinkle the sugar over the top. It was so easy and sooooo delicious. In the morning, once heated and ready to eat I found that it didn’t need any additional sweetening or a topping. Thank you! Lovely – thanks for sharing, Barbara! I made this yesterday. I am not vegan, but I followed the recipe using flax eggs. The only mistake I made was I added 2.5 cups homemade coconut milk instead of 2 cups. I was wondering why my oatmeal mixture looked looser than the video. Didn’t realize that until I read the recipe again this morning, but extra 1/2 cup did bake up well and did work. Looked just like her photo only not as orange in color (wondering if MB did photo editing). 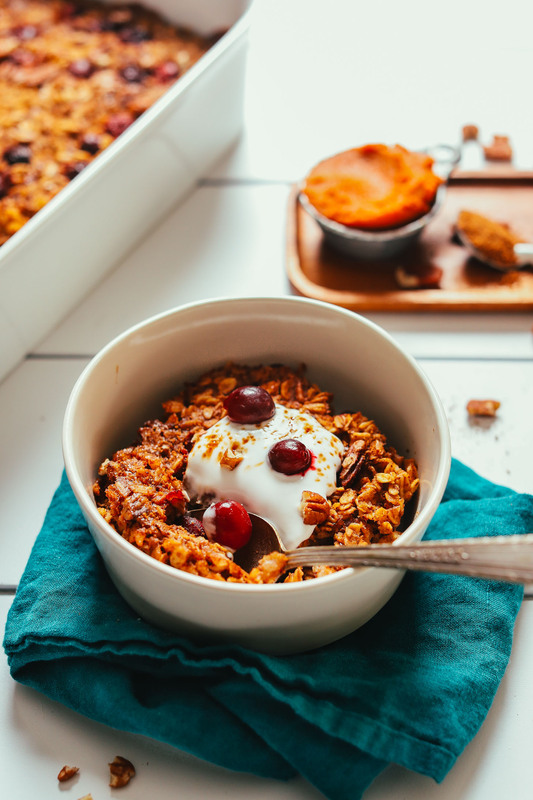 This pumpkin baked oatmeal is really good, satisfying as nd delicious. Oh…I also toasted the nuts before using in recipe. Lovely! thanks for sharing, Della! 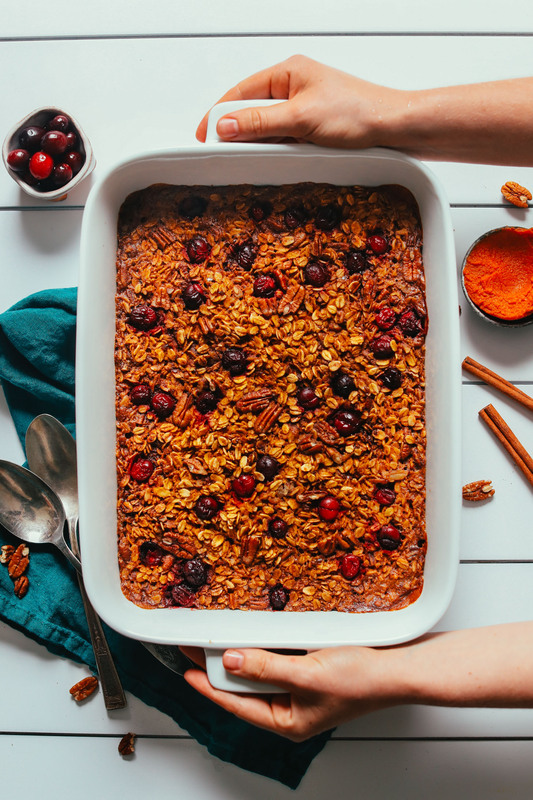 Yum, baked oatmeal is always an incredibly creative way to enjoy oats. 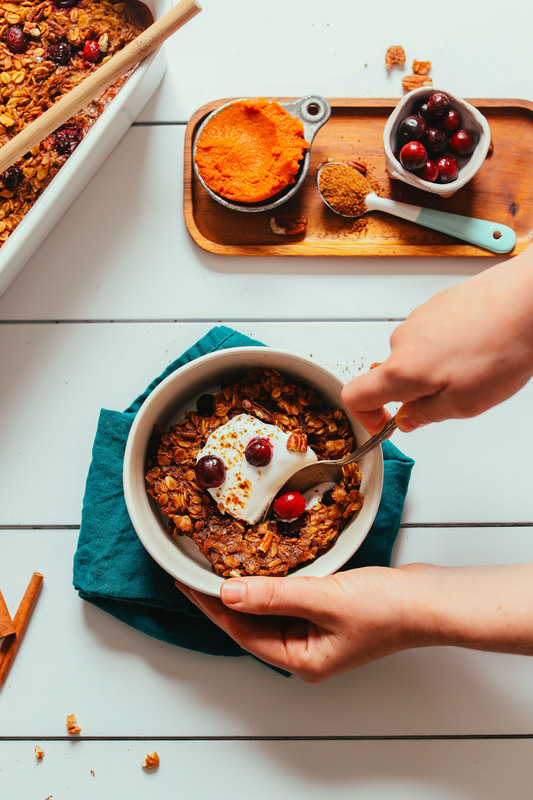 Basically if you wanted a bowl of oatmeal but you also wanted a cake…baked oatmeal is your solution! 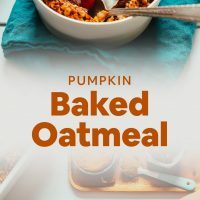 As of lately, pumpkin oatmeal has become a favorite of mine–I’ll be having some pumpkin overnight oats tomorrow and I’ll see if I can bake them! Just made this. It was so quick to throw together and tastes great! Plan on heating it up the next few days for before-school breakfasts. Only change I made was using frozen blueberries b/c I didn’t have cranberries on hand. Will make again with the cranberries….and maybe some orange zest? Mmmmm…..
SMART! Thanks for sharing, Sara! Yay! thanks for sharing, Liz! Used oat milk, subbed the oil and used the same amount pealed and fine grated apple, used dried maulberries and apples, used rice syrup instead of maple (not enough at home) and topped it with a pealed Appel and coconut. We enjoyed it with almond yoghurt and homemade chunky applesauce. Great! Thanks for sharing your changes, Cosamea! I doubled the recipe and baked it in a 9”x13” pan and it worked perfectly (I also extended the cooking time). I will be making this again this week to pack as a quick, healthy, filling, ready reheat and serve breakfast on our upcoming family vacation! Yay! Thanks for sharing, Shawna! 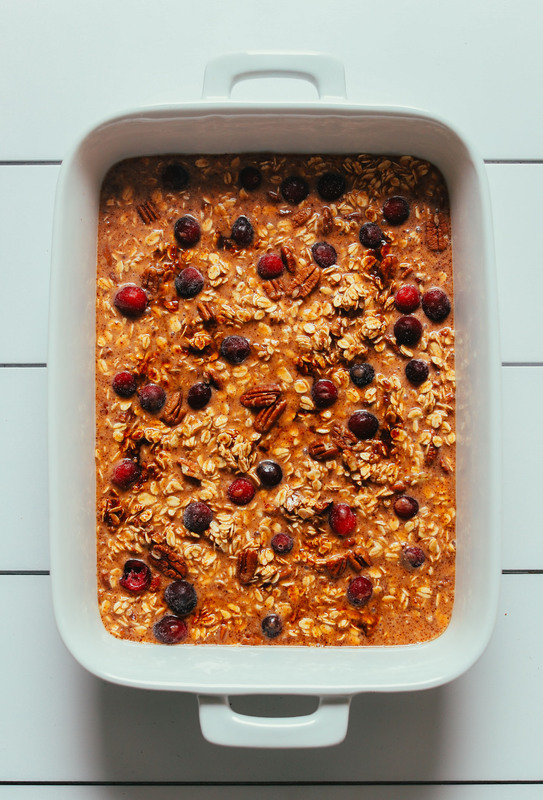 I made this delicious baked oatmeal this morning and it won rave reviews from both myself and my husband. While I am a 25 year-long vegetarian, I’ve not yet gone vegan, but am trying to work my way there. Breakfast for me is the hardest place to give up eggs and dairy. This recipe is a winner and is helping me in that goal! I followed the recipe with the following exceptions: subbed one small, diced apple in place of the cranberries (didn’t have any on hand); subbed toasted raw walnuts for the pecans (not a pecan fan); used the Califa half coconut/half almond milk for the milk – easy as it was already mixed for me. I topped it with toasted/raw pepitas and sprinkled with additional pumpkin pie spice. I have a convection oven and cooked it for 35 minutes on convection bake, then let it sit for 5 minutes. PERFECT! Thanks for another amazing recipe!! Thanks for sharing your substitutions, Beth! “everyday.” My husband, who normally doesn’t like this type of breakfast, even went in for seconds. The leftovers were yummy the next day too. I just prepped a batch for tomorrow morning. Last time, I prepared right before baking. Anxious to see if this changes anything. Also, this time, i used walnuts instead of pecans because that’s all i have. Yay! We are glad that everyone enjoyed it, Anne! Great recipe! My whole family loves it and we are sure to make it many times this fall. Such a wonderful, warm dish to wake up to! I used fresh eggs instead of flax, and didn’t have cranberries or nuts, but followed the recipe besides that. I mixed everything the night before & put the pan in the fridge overnight; I ended up needing to bake it just a few minutes longer. I’ll definitely make this again! My son ate a serving for dessert – he put a little warmed-up chocolate pudding over it, and it was *amazing*! Perfect comfort food for chilly days. Yay! We are glad it was a hit, Caren! Made this and it was delicious and made a pretty presentation I’d love to bring it to a brunch! I felt like it could have been a bit more pumpkin-ey I think next time I’ll double the amount of pumpkin. I didn’t have any cranberries so I used an apple. I really want to try it with the coconut whipped cream next time! It was perfectly spiced and comforting for fall! Delicious! It’s so simple to put together and frozen cranberries are a great burst of flavor. I had a piece right out of the oven and each morning I heat a piece and it’s just as delicious! I made this recipe last night and used blue berries because it saved a trip to the store. The outcome was great. I’m wondering about the use of various fruits in the recipe—–peaches, pears, apples, fruit cocktail and how they might impact baking time. I’d also like to say how much I appreciate this website and the available recipes. I’ve made a number of them. I switched to a plant based diet 6 months ago, and the learning curve in re-learning how to cook and what ingredients to use has been shortened by use of the minimal baker website. Thanks for your help, support, and selfless sharing of recipes. I made this yesterday and its amazing!! I added a scoop of vegan vanilla protein powder and turned it into muffins, to make this recipe a more filling and portable breakfast for this week’s meal prep. Turned out so good and definitely will be making again!! Great – thanks for sharing! This was amazing! I had some pumpkin purée left over and have been trying to think of something to use it up on. I don’t generally like oatmeal because it never fills me up but this did! It wasn’t too sweet, just the right amount of pumpkin flavor, and the texture was great. I didn’t have cranberries but once it was done I topped it with sliced bananas and a drizzle of maple syrup. I will definitely be making this again. Thank you! Whoop! We are glad you enjoyed it, Shelby! Just made this with dried cranberries, TJs coffee syrup and TJs pumpkin spiced pumpkin seeds. It was delicious was a scoop of yogurt and honey. Thanks for the easy, satisfying recipe. Also, this was my first time making flax eggs! Can’t believe how easy it was! I used aqua fava (1/3 c), and whipped it to soft peaks—instead of chia seeds or eggs-and it worked great. I’d love to make it more pumpkin-y next time, and maybe add banana. Oh, and I only used 1Tbsp oil, and won’t use any next time. Thanks Dana, for all your wonderful recipes! So good! I used two regular eggs instead of the flax eggs and it turned out lovely. I also cut up apples as my fruit and ground walnuts for texture. So simple and so satisfying – thank you!! Made it exactly as written, and it was fantastic! Very easy, too. Yay! Glad to hear it, Trista. So good. I would add a bit more sugar but you don’t need it if you add sugar-free maple syrup and I added Reddi Whip coconut whipped cream (non-dairy) after you heat it up to eat. Made this for a big brunch party and it wasn’t a hit with everyone – folks couldn’t get the pumpkin flavour, and the texture wasn’t what I was expecting. I’m going to add a bit of almond milk to remoisten and give it another short bake to see how it goes. I loved how easy the recipe was, though! Thanks! I rebaked it and am enjoying it with extra fruit. We ate this this morning and it’s soooo good. It feels so much fancier than regular old oatmeal. Simple yet perfect to serve to guests. I might just add a dab of coconut whipped cream on top next time to really make it fancy. Two thumbs up! So good! I opted for applesauce in lieu of oil just because I had just made some. Delish! Wonderful! We will be adding this to our list of favorites! I made it exactly as listed, but likely will leave out the syrup next time and just let the kids drizzle some on top after it bakes. Thanks for another winner! Eating a mug of this concoction now! The flax had gone off, so I substituted: 1.5 teaspoons of ground chia – with 3 tablespoons of water, allow to sit until it forms a gel to make a substitute for one egg. It’s so good that I’m looking for more pie pumpkins this weekend! I’m eating a mug of this recipe now. Fantastic. Thankfully so as I made a double recipe. 1.5 teaspoons of ground chia – with 3 tablespoons of water, and allow it to sit until it forms a gel to make a substitute for one egg. Heading to find more pie pumpkins so I can make this again this winter! Added 1/4 c. hemp seed and used Bob’s Red Mill Egg Replacer powder. Delicious! Will make again! Plan to try it with walnuts and bananas one day, but for now the pumpkin rocks! Yum! Thanks for sharing, Irick! Great! Thanks for sharing, Anna! So delicious! I used 1.5 apples instead of cranberries, and it tastes great. Our house smells so good, too! Great! Thanks for sharing, Mo! I absolutely love your recipes – please never stop sharing them <3 Greetings from Slovakia! Hi Dana, I’ve been looking for a vegan baked oatmeal recipes! Do you think it would work the same with steel cut oats? I think you should probably add more diary-free milk and cook a little longer! Hi, I am currently pregnant with my 3rd and only 5 weeks to go! I’m trying to make freezer meals for us all, do you have any idea if I ought to cook this first and then freeze or just assemble and freeze to be cooked when ready to eat, etc? Any tips would be great if you have any, thanks so much! Looks delicious! I would say bake and then freeze. Then reheat in the microwave or oven until warm, adding more dairy-free milk as needed! This is amazing! Thank you for this recipe. I made a few changes. I pressure cooked and pureed butternut squash instead of pumpkin. (Butternut is a perfect substitute for pumpkin.) I ran out of flax, so I used eggs. That works very well. I used chopped walnuts, and for fruit topping I used blueberries, raspberries, and blackberries. I used organic cane sugar for the top. Just made this amazing dish using regular eggs, GF steel cut oats, walnuts and dried cranberries. Filled my home with the most tempting aroma perfect for this fall day! Do yourself & family a favor, make this asap; easy recipe & great results. Did you use the same amount of steel cut oats as rolled oats? Great! Thanks for sharing your changes, Karen! We are glad you enjoyed it! Sadly, I am allergic to oats. Is there anything else you could recommend for the crunchiness? This looks delicious and excited to share with my daughter. What about trying amaranth, quinoa, or millet? I’m a big fan of buckwheat kasha – it’s technically a seed and very nutritious. Any suggestions for how to make this with quinoa instead of oats? wouls I add more non-dairy milk and cook it longer? Looks delish!!! Hmm, I’m not sure about that. I’d assume it would work but yes, maybe increase dairy milk and cook longer. I’d also suggest soaking the grains overnight before cooking? Let us know if you give it a try! Quinoa Flakes might be a better choice instead of the whole seed. I’m always looking for uses for my quinoa flakes. Thanks for the idea! I just ate this for breakfast and it was awesome! I assembled everything last night, stuck it in the fridge, and then baked it this morning for an easy breakfast for my family. Made this morning super stress free and I have leftovers for the rest of the week. Did almost everything as instructed, except I’m not vegan, so I used 2 eggs (instead of two flax seed eggs) and used brown sugar and it worked out great. Didn’t have cranberries so I used dried cherries and then topped it with yogurt/seeds/honey for serving – SO GOOD! Any substitute for the flax eggs? I can imagine Applesauce would work too, chia egg or more pumpkin puree .. ? Helina, those are great substitutions! How do I sub the flax egg… just 1 regular egg? I think that would work! Let us know if you give it a try. I usually say 1 flax egg = 1 small egg. Can you use regular eggs? I’m not vegan and I don’t have flaxseed meal. Hey there. I just made this after seeing it on my news feed, and I have to say this is excellent. I only made a minor change because I didn’t want to wait until going to the grocery store to buy pecans. I used walnuts and coconut palm sugar. Will definitely make again and again. Yay! Thanks for sharing, Ron!